Some say that the word "Scotch" is reserved for the description of Scottish whisky. Anything else should rightly be called "Scottish". For example, what some refer to as "Scotch Pies" should properly be called "Scottish Meat Pies". With that in mind I stand by my description of this week's recipe for "Scotch" Mushrooms and you can probably already guess why. Yes, one of the ingredients is Scotch Whisky. We used Scotch in another recipe recently. If you bought a bottle to use in that recipe I recommend that you drink the remainder and buy a fresh bottle. Scotch that has been left in an opened bottle too long is not suitable for cooking. Trust me on this. If your spouse doesn't believe that story, just tell him or her that you read in Blighty's British Recipes - so it must be true. Scotch Mushrooms is a superbly easy recipe and makes a good appetizer. It is simply marinaded button mushrooms. 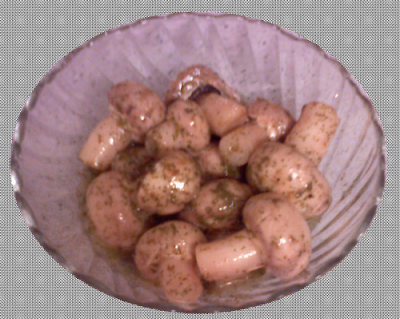 I made my Scotch Mushrooms with raw mushrooms to make a light and delicious salad appetizer. Some may prefer to lightly cook the mushrooms before adding the marinade. Fantastic recipe! We tweeted it! We had Master Distiller Bill Lumsden from Glenmorangie on our chat today. He suggested that white fish and foie gras pair well with scotch. Thanks for sharing this great recipe!